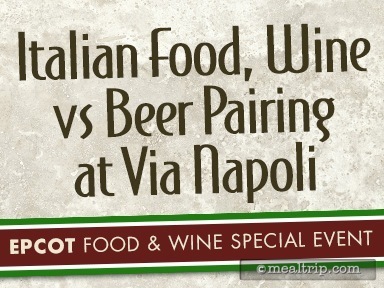 Italian Food, Wine vs Beer Pairing at Via Napoli is a special event that only takes place during the Epcot International Food and Wine Festival. The pairing lunch is held in the "west wing" of Via Napoli. It's a section of the popular Epcot restaurant that's easy to quarden off for the duration of the event. The format here is simple, there's five courses (with a few extras here and there) and each of the five courses is paired with a beer and a wine, so that you can decide which beverage you like best with each course. The event contains a great mix of education and food and is presented in a way that doesn't feel rushed. Pricing has historically been right in the middle of the "special event" range during the Epcot Food and Wine Festival. 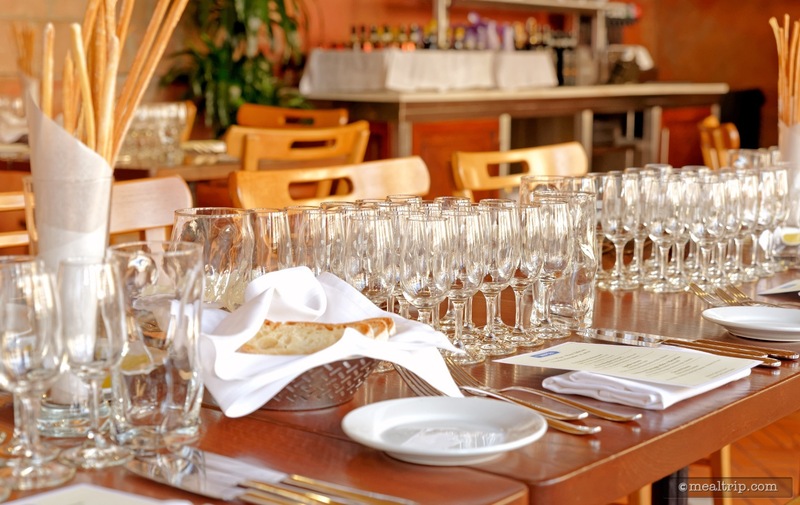 For the 2016 season, the lunch is $88 per person and is actually a good value (relative to other special events) for all of the food and beverages that you will get to sample. The event is quite popular, and bookings for this one fill up fast. You'll want to be on the phones making a reservation as soon as they become available (usually a few months before the festival starts). 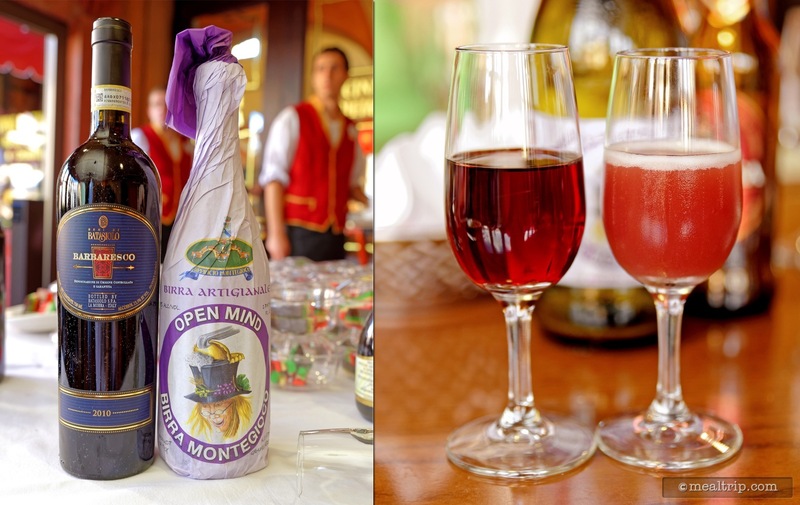 The Italian Food, Wine vs Beer Pairing at Via Napoli event started out as a "beer only" lunch held only during Epcot's International Food and Wine Festival. After one or two years of "beer only" mode, wine was added to the mix, and that… made an already great event, even better! The lunch is held in what I call the "west wing" of Via Napoli. It's an air-conditioned annex of sorts that has room for around 60 guests. This is a five-course, casual event where you'll have plenty of time to discuss the food and beverage options in-between the informative and entertaining presentation segments. I don't believe there are any tables set for two. The smallest is a table for four, so chances are pretty good that you will be sitting with other guests if your group is smaller than four members. I've been to this event a few times now, and the group seating here doesn't seem to be a problem… so long as you're aware of the seating arrangements going in. There is a check-in podium next to the outside entrance of the Via Napoli "west wing" that's just for Wine vs Beer Pairing guests (there's usually a sign over there as well… if you're looking at Via Napoli, the west wing is to your right). Guests do arrive and check-in early but the seating here is (more or less) pre-determined. 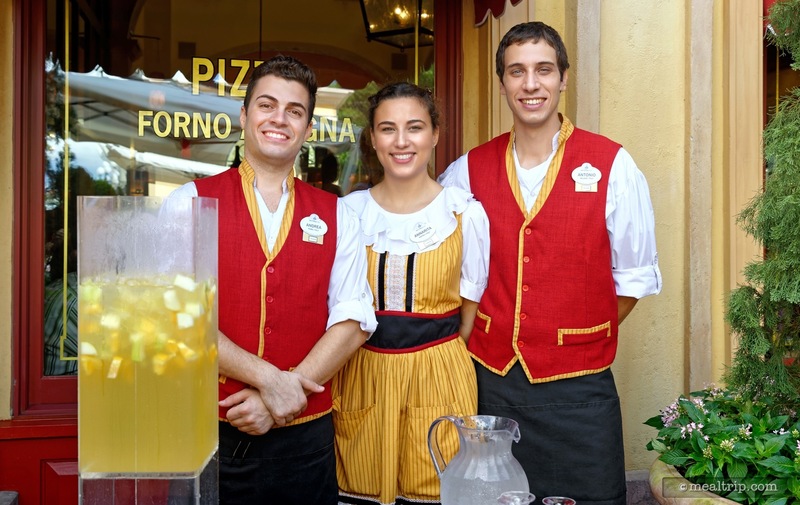 After checking-in, 2015 guests were offered a complimentary sangria while they waited, (which is a great reason to check-in early, but you do have to wait outside). They only start seating guests about ten minutes before the event was set to begin and unless the free sangria clouded my judgement, your party name is called in the same order that you checked-in… meaning if you checked in first, your group went in first (or close to that order anyway). As I mentioned before, seating here is predetermined, but if there are fewer people in your party than there are chairs at a table, you do get to choose where you want to sit at that table. I know that doesn't sound like much but I thought I'd mention it… just in case you have a preference for sitting "across the table", or "side-by-side" from your party. 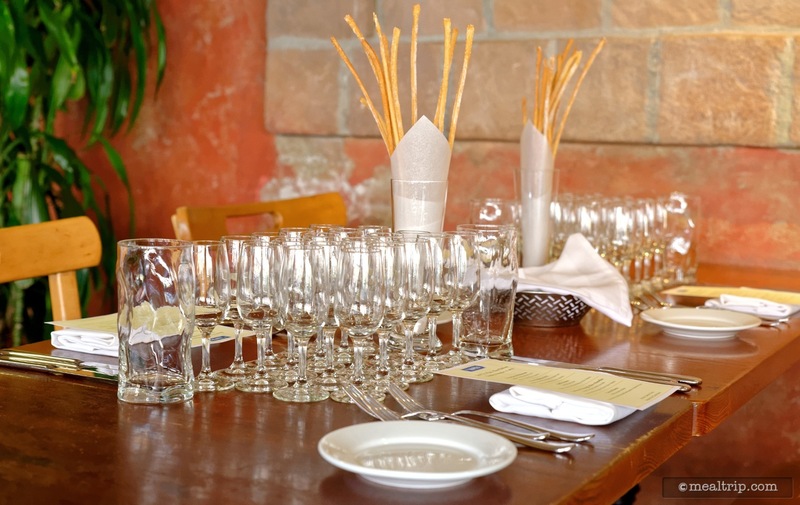 You can't help but notice that the tables are set with ALL of the glasses (that's eleven glasses total) and flatware that you'll be using during the lunch, along with some bread, thin pipe breadsticks, olive oil, balsamic, a grated cheese dispenser, and thankfully… a menu that outlines the beer, wine, and food item that makes up each course. It's a great photo-op for sure, as you only see this many pieces of glassware at extremely formal events. Water is offered as your server introduces him or herself (but if you're like me, you'll grab another sangria just before they call your name at the check-in podium)... and while the bread, olive oil and cheese combo on the table doesn't seem like much… it is pretty good olive oil, and it can take 10 minutes for everyone to get in and settled. After two sangrias, I'm glad the bread was on the table. The format here is repeated over five courses. There are two presenters, one is either a sommelier or wine distribution representative, and a second presenter is a cicerone (that's basically a "beer sommelier")… they both give out a bit of information about the two beverages for each course, as the servers make their way around the room filling everyone's glasses (with just those two beverages). 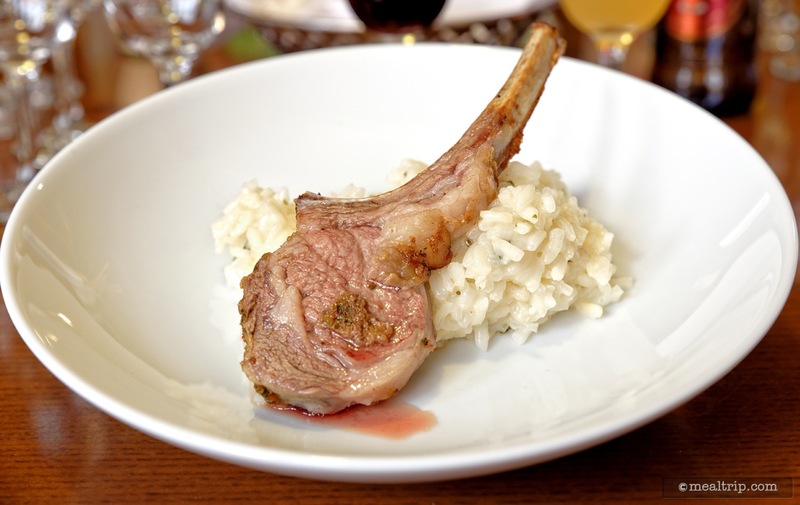 Then the food item for that course is brought out, and you're given ample free-time to decide which beverage, the beer or the wine, pairs best with the food from that course. This is all very informal and a "raise of hands" poll is taken after everyone is finished just to see if the beer or the wine "won" that particular round. 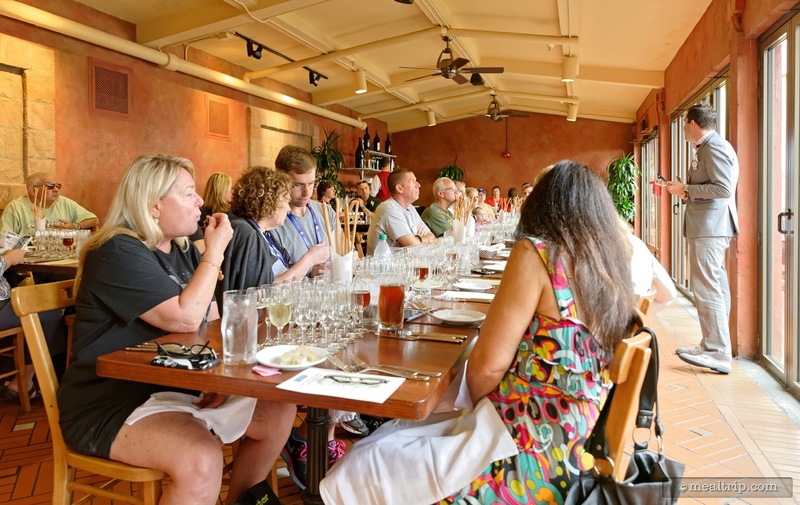 For me, this is the perfect format for what a Food and Wine event should be… they seem to strike just the right balance between great food and beverages, information/education, and a little fun audience participation with the voting. After the first course, everyone in the room is super friendly, and the rest of the event unfolds as a truly fun, memorable experience. 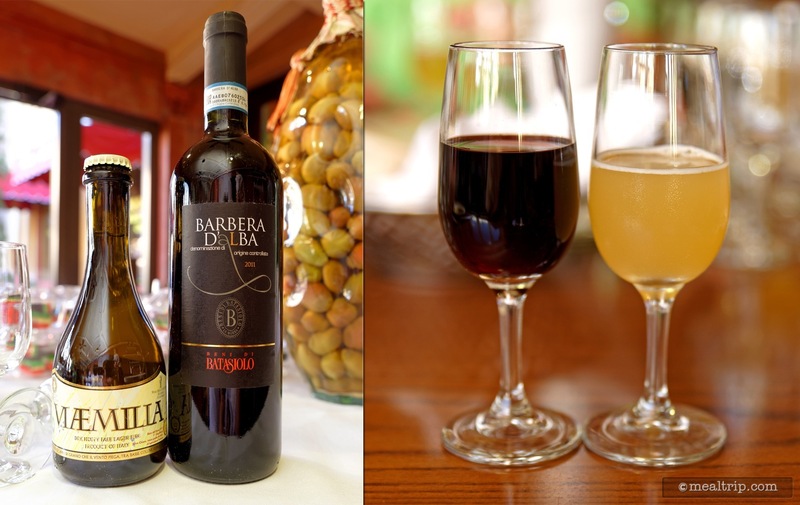 The wines and the beers (especially the beers) were quite a bit less common than what you'll find at most "beer festival or beer pairing" type of events (beers like Birrificio del Ducato's Via Emilia and Birrificio Grado Plato's Chocarrubica are not so easy to find in America). 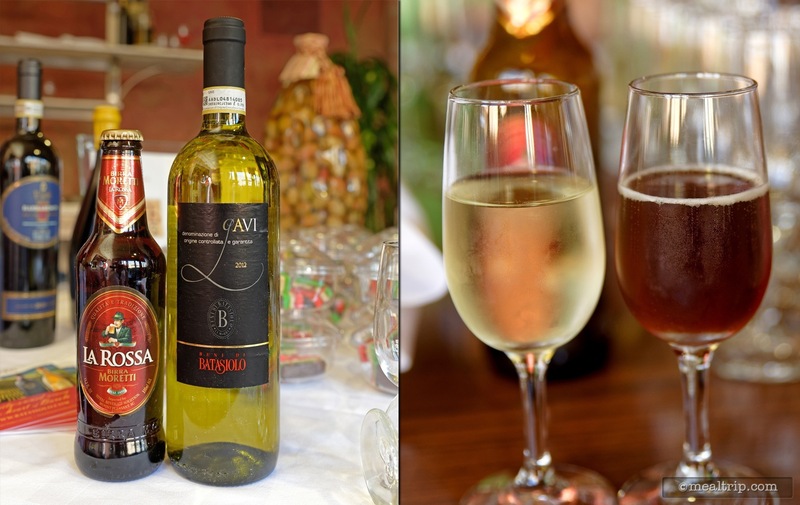 Most of the beers were imported from Italy, and in some cases, the beers were so hard to get in quantity that import planning started ten months before the lunch. The food courses do change a bit each time they hold a lunch. Executive Chef Charlie Restivo makes sure that only the freshest ingredients are used, and he plans each meal very deliberately for the pairing. With that being said, the changes on the menu from week to week are more like tweaks than major overhauls. 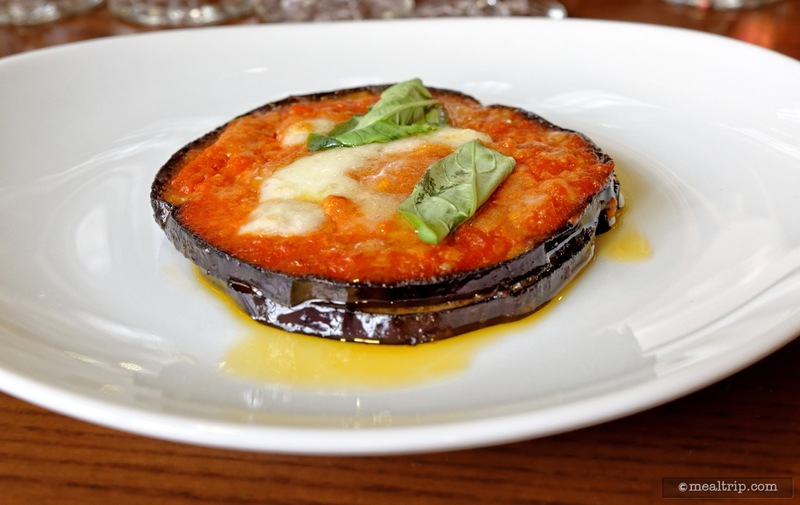 The five food courses that were presented on my recent visit to the event started with a Parmigiana de Melanzane which was an amazing dish combining eggplant, tomato, mozzarella and basil (beverage pairing for each of these courses are listed in the photo gallery of this review). The next course is usually a variation on one of Via Napoli's Pizzas, in our case it was the Margherita Pizza (a cantaloupe and prosciutto pizza had been presented on a previous visit). 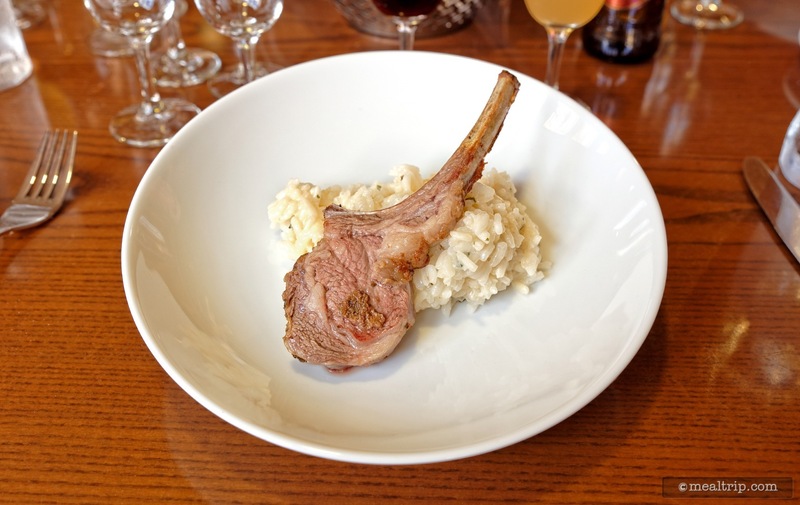 The third main course was an Agnello Arrosto Lamb Chop, which was perfectly cooked… but the real star of the dish was the mint risotto that the lamb was placed on. Risotto is not the easiest thing to get right, but this risotto was done right. 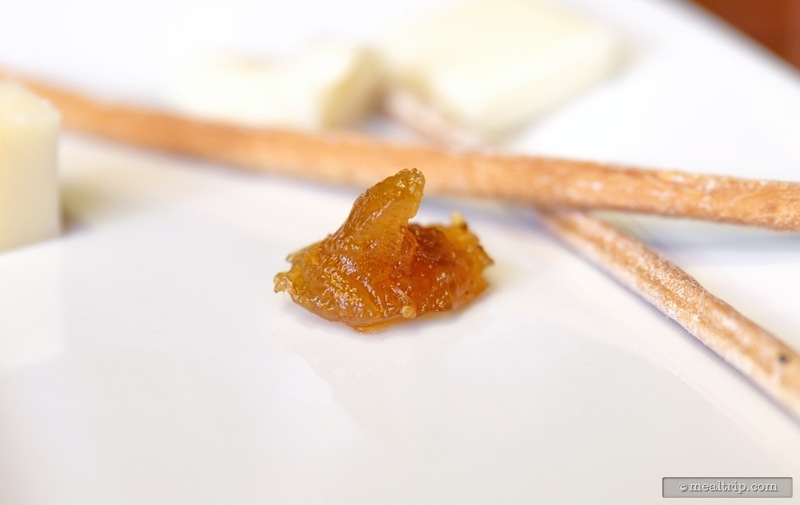 The herbal and peppery notes of the mint were highlighted, and not the sugary mint that you might first think about, when reading the menu. 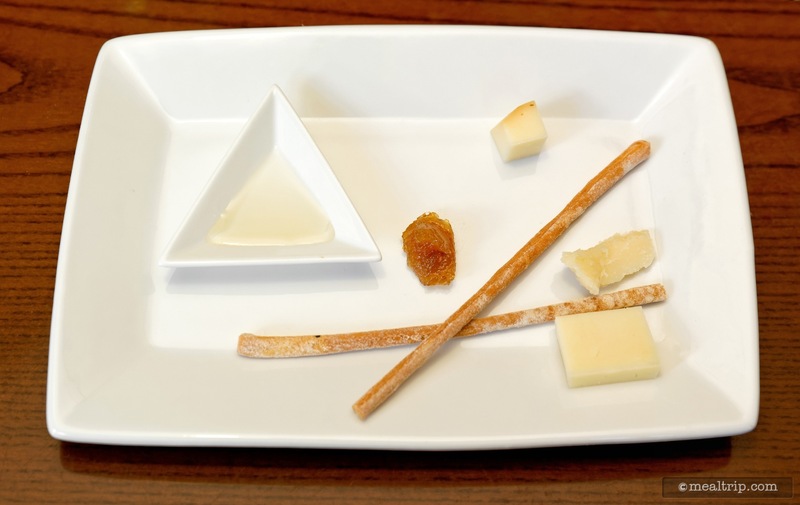 The fourth course was a cheese plate… a very large plate with a very, very small amount of cheese rather. 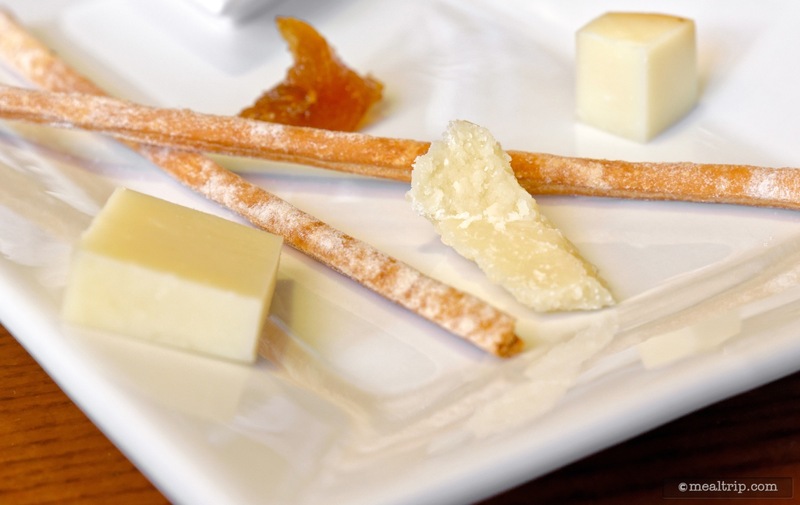 Okay… I know, I know, I know… good cheese is expensive, and honestly… this was the correct course to serve a cheese board, and all of the cheeses and their tiny companions (such as honey, and fig paste, etc.) were spot on. I think because at this point, you're on beer and wine samples #7 and #8, I was just looking for more food. Here's were you mindlessly start eating more of the bread and breadsticks that are at the table. The final course was dessert, and that was a brilliant chocolate and hazelnut cream polenta. This was not a "sweet" dessert, but it did include a well coated dark chocolate base for those that are looking for a chocolate fix. I just have to mention the beer pairing with this one again because it's just so darn hard to find in the US, Birrificio Grado Plato's Chocarrubica is a great beer, for just this kind of dessert. Now I'm sure you're wanting to know, which beers and wines "won" with each course. Honestly, I have no idea. After ten wine and beer samples (and yes, there were a few refills here and there), it all becomes a bit of a blur. There are a few that standout as being great, and a few that standout as being not so great. The event itself, is just plain fun. I think because most of the food and beverage are easily accessible to most pallets, you don't have to come in with a high level knowledge of wine or cuisine to enjoy all that's being offered, and for those that do know a thing or two about beer or wine, you'll appreciate that these samples (while not being on the high end of a vertical tasting), are one step higher than the kind of day wines that seem to be so prevalent at the kiosks around World Showcase. I have a feeling that this event is booking out extremely quickly but you never know, there still may be some reservations here and there. I just wouldn't expect to find any walk-up opportunities on this one. It's quickly becoming a guest favorite… especially if you feel like some of the other World Showcase dining events are too exotic. 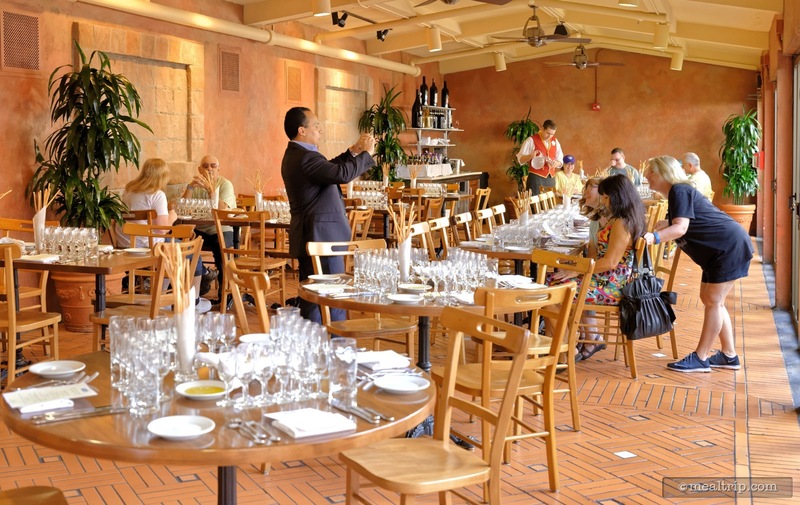 This Italian Food, Wine vs Beer Pairing Event and the Parisian Breakfast over at Chefs de France are two great gateway events into the culinary special event programs during the Epcot Food and Wine Festival. Don't take my word for it though… be sure to check out our photo gallery of the actual event last year… and if you've been to this event in the past, or are going this year… be sure to leave a review, and let us know what you think!